For Alpine hiking, Patscherkofelbahnen is the perfect choice. South of Innsbruck is a perfect vista mountain called the Patscherkofel. 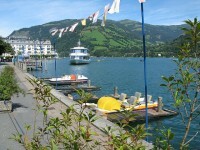 You can find it close to Tirol’s capital city. Well-known for its superb views, expect to see cozy mountain huts and special flora completing a scenic paradise. For families with children, the walking trails are suitable for kids as well. 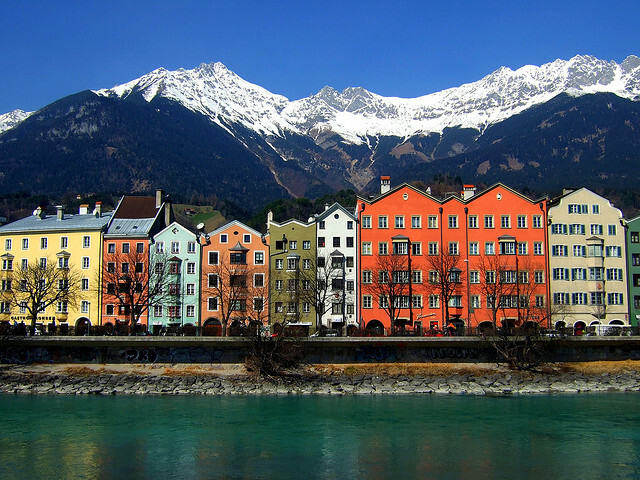 Innsbruck is worthy to the popularity it gets, you will not regret to choose it as a vacation spot. Spend some time in the most beautiful Folk Art museum in Europe, Tyrolean Folk Art Museum. You will see it in the historic district of Innsbruck, right next to the Court Church. This folk art museum dates back to 1929 and it features wonderful exhibits collected within the old borders of Tyrol. Some of the exhibits were even from the Province of Treno. If you want to see some things of the past from the Ladin valleys of the Dolomites in Italy, you can find them here in Innsbruck too. People who like arts and crafts, masks, traditional dresses of Tyrol from different social strata are exhibited here. Applied arts, home industries will gain much inspiration during the sight seeing. The reproduction of the farmhouses and the Medieval parlours are certainly very enchanting. So during the Christmas season, there is a Tyrolean crib and workshop specially for kids. Some people even celebrate their children’s birthday there with parties. Quite a good idea for something special for the young ones. The other Tyrolean experience for music lovers are evenings with the famous Gundolf Family. They have been musical ambassadors since the 1967 surprising there audiences with much entertainment. Expect an enthralling experience as they are true lovers of music, see those yodeling, ‘shoe-slapping’ and folk dances with the authentic Tyrolean music. All happening at Sandwirt Restaurant daily from April through October. And for Christmas, there are christmas concerts which are well orchestrated by this wonderful family. 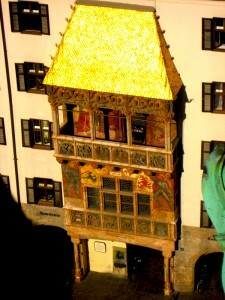 Next up is the Golden Roof, the most characteristic landmark not to be missed. 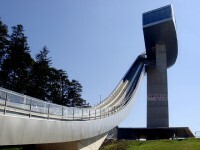 This attraction was built in the 15th century. The Archduke Friedrich IV built it as the residence of the Tirolean sovereigns, so it has an earlier name as ‘Neuhof’ which means ‘New Court’. This three-story balcony on this house is what came to be so well-known in the heart of the Old Town in Innsbruck. The golden part was the late Gothic oriels which were capped with 2,600 gold-plated copper tiles! In those days, it was functioning like a royal box for the Emperor Maximilian I to enjoy tournaments held on the square. What a luxurious way for enjoyment and entertainment you must be thinking, sitting on a construction such as this. 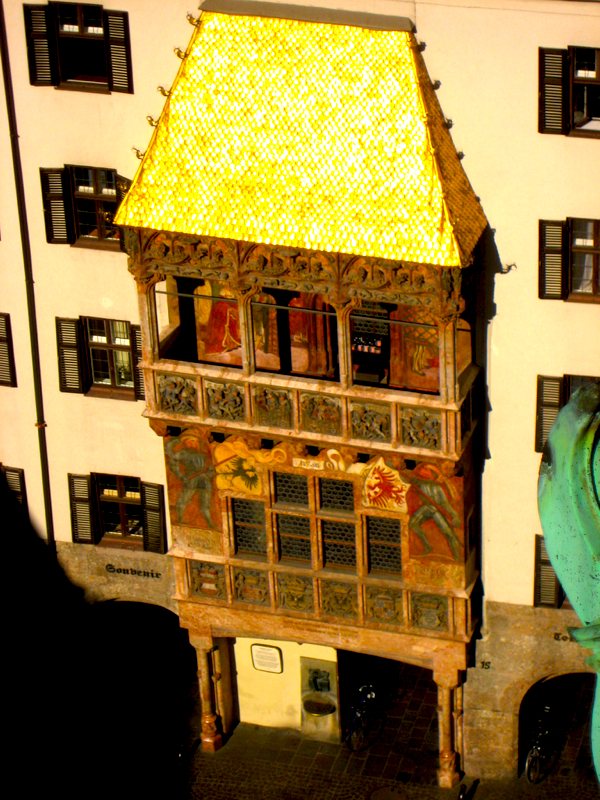 As Maximilian was a ruler who expanded his territory through marriage (not conquest), the Golden Roof was built in honor of Emperor Maximilian’s second marriage to Bianca Maria Sforza of Milan.